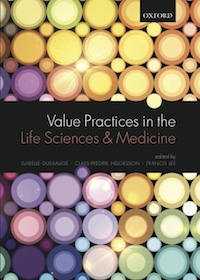 Value Practices in the Life sciences & Medicine is a new edited volume of scholarly work that takes an interest into the enactment, ordering, and displacement of a broad range of values in the life sciences and medicine. The volume articulates a pragmatist stance for the study of the making of values in society, exploring various sites within life sciences and medicine, and asks how values are at play. This approach means taking seriously the work scientists, regulators, analysts, professionals, and publics regularly do, in order to define what counts as proper conduct in science and health care, what is economically valuable, and what is known and worth knowing. A number of analytical and methodological means to investigate these concerns are presented. The editors suggest the notion of valuography to identify an empirically oriented research program into the enacting, ordering, and displacing of values. They argue that a research programme of this kind, makes it possible to move orthogonally to the question of what values are. This move rectifies some central problems that arise with approaches that depend on stabilized understandings of value. At the heart of it, a valugraphic research programme encourages the examination of how and with what means certain things come to count as valuable and desirable, how registers of value are ordered as well as displaced. It further encourages a sense that these matters could be, and sometimes simultaneously are, otherwise. Dussauge, Isabelle, Claes-Fredrik Helgesson, and Francis Lee, eds. 2015. Value Practices in the Life Sciences and Medicine. Oxford: Oxford University Press.